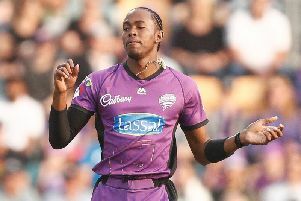 Sussex head coach Jason Gillespie admits he can’t wait to have Jofra Archer and Chris Jordan back in contention for Sussex duty as he looks to ease the burden on his seam attack. The county has made a good start to the season, losing just once in their first five Championship games and then winning two out of three in the Royal London One-Day Cup ahead of Friday’s meeting with Middlesex at the 1st Central County Ground in Hove. They have done so despite the absence of Archer and Jordan, who took 116 wickets between them last season but who have spent the last six weeks at the Indian Premier League. In their absence, Ollie Robinson, David Wiese and India’s Ishant Sharma have shouldered most of the fast-bowling burden, but Gillespie is keen to give them a rest. Robinson and Wiese have played in every game so far and bowled a punishing 197 and 184 overs respectively, while Sharma has clocked up 139 despite missing a Championship game because of a shoulder injury. Robinson has taken 31 wickets in all competitions and Wiese 24. Gillespie said: “Those three guys have borne the responsibility of bowling a lot of overs in the Championship and at the start of the Royal London Cup and have done a magnificent job, they really have. To keep coming in day after day has been a superb effort, physically and mentally. Archer’s involvement in the IPL ended on Wednesday when his Rajasthan Royals team were knocked out by Kolkata Knight Riders, who now go on to face Jordan’s Sunrisers Hyderabad on Friday for the right to play in Sunday’s final against Chennai Super Kings. Archer picked up 15 wickets and he could be in contention as early as Sunday, when Sussex begin a run of three successive away games in the Royal London One-Day Cup against Gloucestershire at Bristol. Jordan could be back for what could be a key game against Surrey at the Oval next Tuesday and while Archer played in ten IPL games Jordan has been a bit-part player at Sunrisers. Just like 2016, the all-rounder has made just one appearance and that was back on April 19 when he bowled four wicketless overs. He will certainly relish a return to county duty. Meanwhile, Gillespie says Sussex will go into Friday’s match against Middlesex full of confidence after Tuesday’s 75-runs win over Somerset, when Luke Wright made the tenth one-day century of his career in his 201st match.